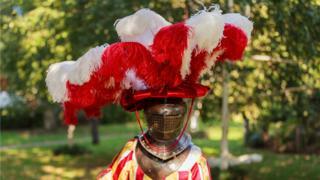 A lavish red and white ostrich feather headdress, designed to make its 16th Century wearer stand out from the crowd, has been recreated. The original 1m (3ft 2in)-wide bonnet was made in 1521 for Matthaus Schwarz - the German credited with creating the world's first book about fashion. It has been recreated by the University of Cambridge for an exhibition in Germany this summer. Schwarz wore the headdress for a meeting with the Archduke of Austria. Cambridge University history professor Ulinka Rublack said: "You could have spotted him half a mile away." "I had no idea how [the headdress] commanded space - and how many hours of labour and what skills went into it," said Prof Rublack. It took five milliners, along with costume-makers and their assistants to recreate the hat, working on and off for a period of six months, in a joint project with the School of Historical Dress, London. The design is based on a watercolour of Schwarz, then 24, wearing the headdress in one of many pictures he commissioned of himself over 40 years which were compiled in a single volume called The Schwarz Book of Clothes - regarded as an early fashion bible. Feathers had became a fashion craze, with headdresses brought to Europe from the Americas, and ostrich feathers also imported from Africa. Prof Rublack said men used such headgear "to show off their knowledge of new technologies, crafts and global cultures to make their way in the world". Schwarz, an accountant for a family of merchant-bankers in Bavaria, commissioned the hat for his introduction to Ferdinand of Austria. Professor Rublack said it must have been successful as the emperor later ennobled Schwarz, but he did not use the title. The headdress will be part of an exhibition about Matthaus Schwarz at the Herzog Anton Ulrich Museum in Braunschweig, Lower Saxony from May until September.